I still can’t believe this day has come and gone so quickly. It’s the day I’ve been thinking about and training for since mid April. 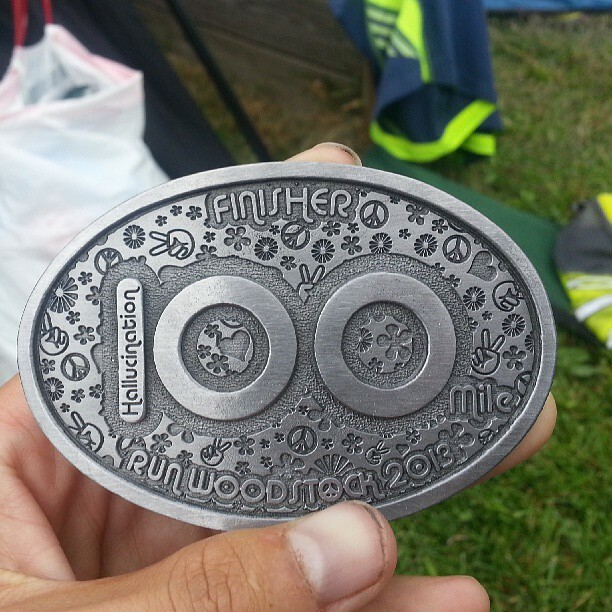 It became my goal race for the year shortly after my first 50. 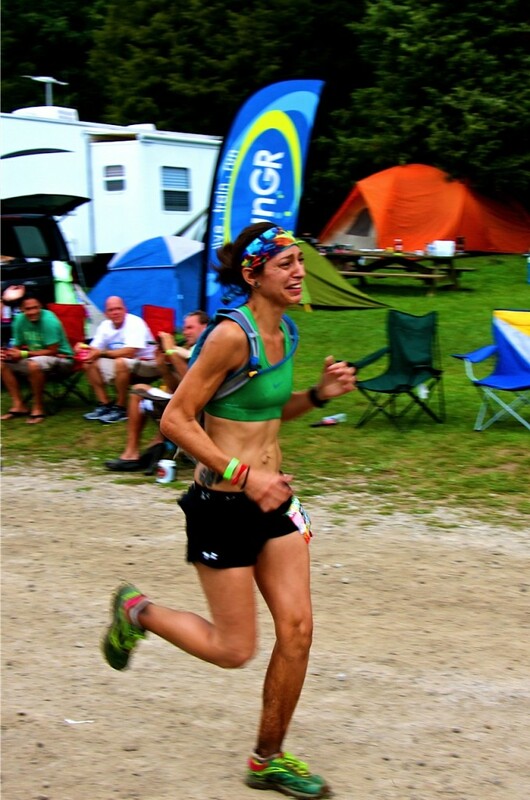 Now, I’m going to try to make this NOT boring and NOT TOOO long, but how on earth do you sum up 23 hours 15 minutes of running, eating, sweating, and struggling into something NOT boring? Wish me luck right? 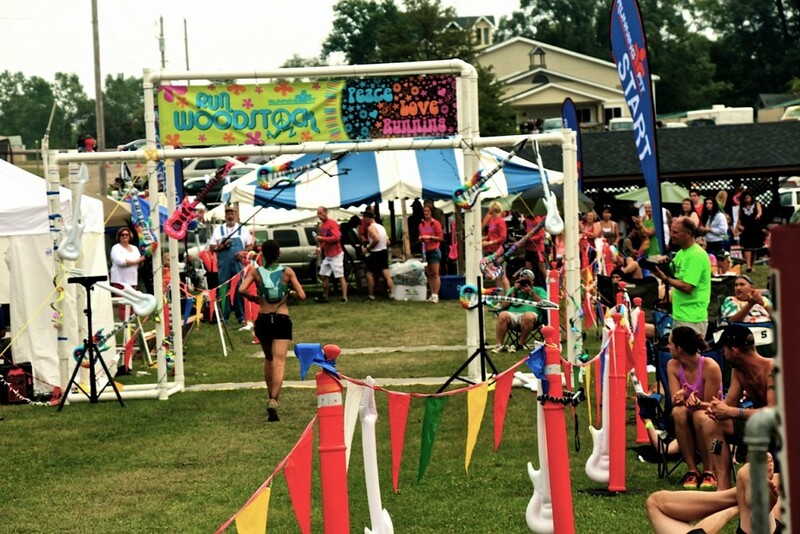 Hallucination 100 is part of the Run Woodstock weekend down in Pinckney, Michigan. 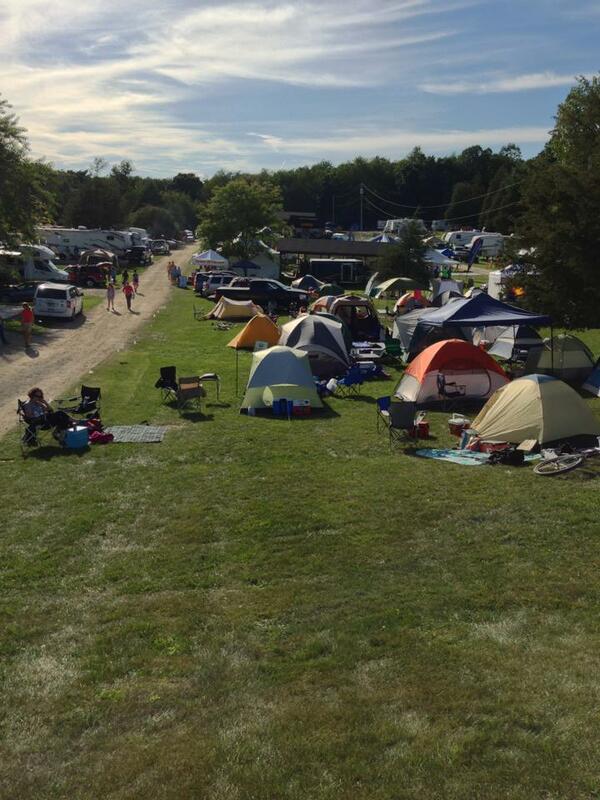 Runners, crew, “roadies” and other race officials camp out for the weekend down at Hell Creek Ranch while 100 mile runners run a 16.6 mile loop in the beautiful Pinckney Recreation Area. 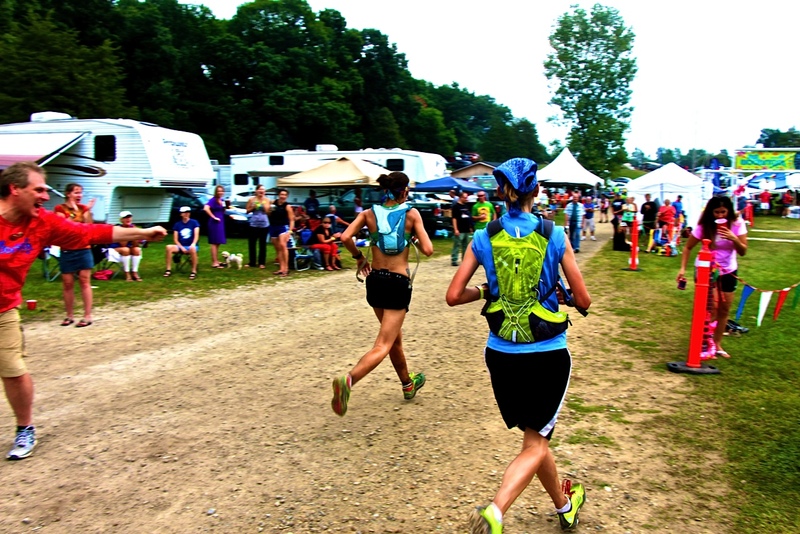 The entire weekend is full of other running events including 100k, 50m, 50k, marathon, half marathon, 10k and even a 5k. 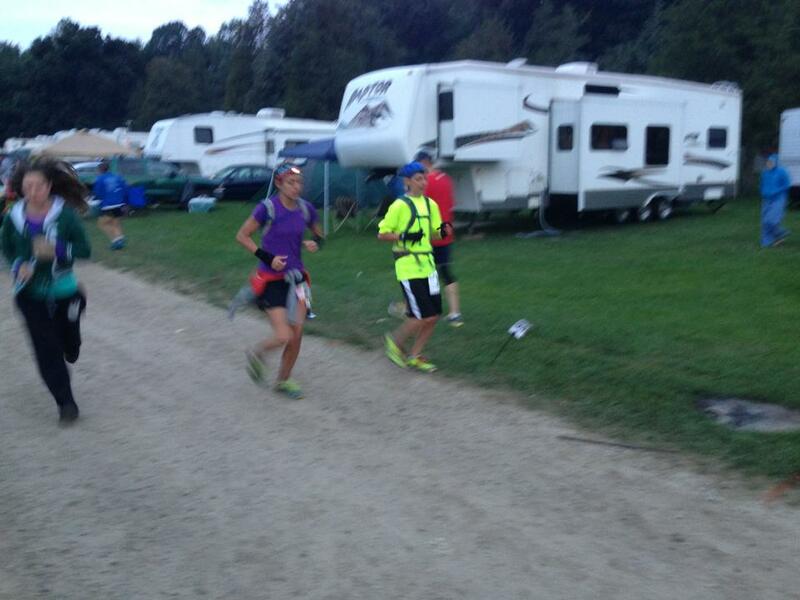 The 100 mile and 100k runners started at 4pm Friday night. At first, I won’t lie, I didn’t think twice about the 4pm start. In the weeks leading up to the race I had second thoughts. This would seriously pose a challenge! I knew I was the luckiest person in the world when my good friend and training partner Jen offered to come out the Pinckney with Steve and I to crew and pace for me! Steve had already been there for almost every ultra I’ve ever run so I knew I was in good hands, when Jen offered to come out I knew this team would get me there no matter what! We decided to leave on Thursday night right after Steve and Jen got done with work. Hopefully breaking up the drive would be easy on my hips, legs and knees. Jen graciously offered to let us drive her xterra all the way out there. Thankfully she did, because there was NO way we would have fit all of the gear in Steve’s car. I organized race gear in bins so that Jen and Steve could find things without digging through my bags. One bin had tanks and shorts, another had long sleeve tops, capris, gloves, jackets and ear covers, another had race food including GU, ginger chews, and salt tabs, the last bin had headlamps, spi belts, mp3 players, garmins, chargers and other random things. I felt very prepared! We stayed Watervilet Michigan. This left us a 2 hour drive in the morning. We even unknowingly drove through a time change :p Anyways after we checked in, I jumped on the treadmill to keep up the runstreak and loosen things up after the drive. Shortly after that, everyone jumped into bed for a great night of sleep. Steve and I slept in til around 8am while Jen got up early and got her treadmill run in and enjoyed a peaceful breakfast, newspaper and a book. Even though we “slept in” I woke up around 7am and tossed and turned until I finally got up at 8. We arrived at Hell Creek Ranch sometime before noon. When registering I had the option to have the car in the rest area or out, I chose out of rest area. I assumed Steve might need to leave at some point and once the car was in the rest area, it couldn’t be moved. We shortly discovered that it was a bad idea. There was quite a hike from the parking lot to the start/finish and our camping spot. Wehad lots of gear and I was running in a few hours. I didn’t want to tire out my pacers already! Luckily, we were able to get the “Hall pass” to drop off our gear and set up camp. I’ll admit the location wasn’t ideal, we weren’t as close to the start/finish as I would have liked but it worked out in the end. We got set up pretty quick and organized things. Jen set up her own small tent right next to ours and we were able to relax and eat a bit of food. At 3pm we headed over to the Ultra Pre-Race briefing. Angela, the RD gave us all the info we needed about the course! The number of people there was amazing! After the meeting it was time to get last minute things on/together and ready to go. I put on my bib, grabbed and filled the spi belt, filled my camelback, and ate a little more food. Before we knew it we were heading to the start line. The Lemon James band played a very interesting version of the national anthem before take off. It fit the theme well, sort of like Jimi Hendrix style! At one point, she was playing the guitar with her teeth! I said “See ya later!” to Jen and Steve and thanked them both for coming out and doing all this work for me! I honestly wasn’t sure which way we were heading out but I followed the crowd of Ultra runners and jumped toward the back of the pack! 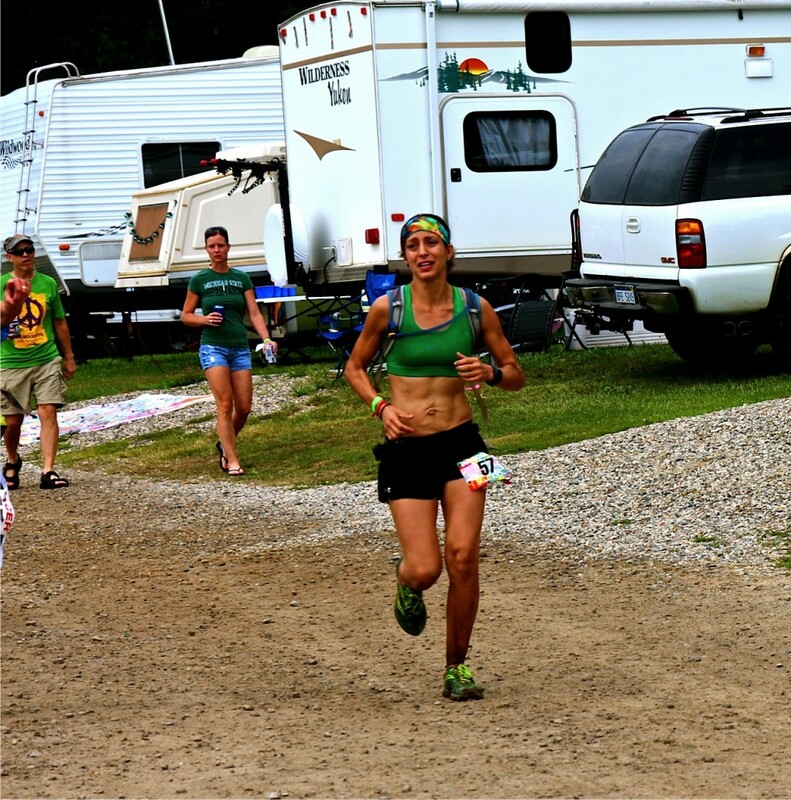 This was a 100 mile race…. no need to start at the front right? 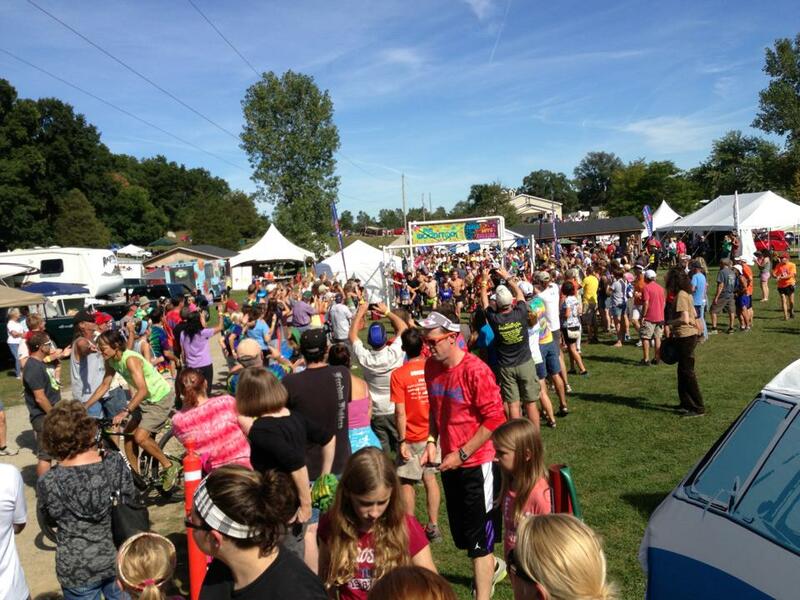 The starting line was buzzing with positive energy and tons of cheering! I was smiling, I’m sure, one of my biggest smiles ever (and I think I have the photo to prove it). 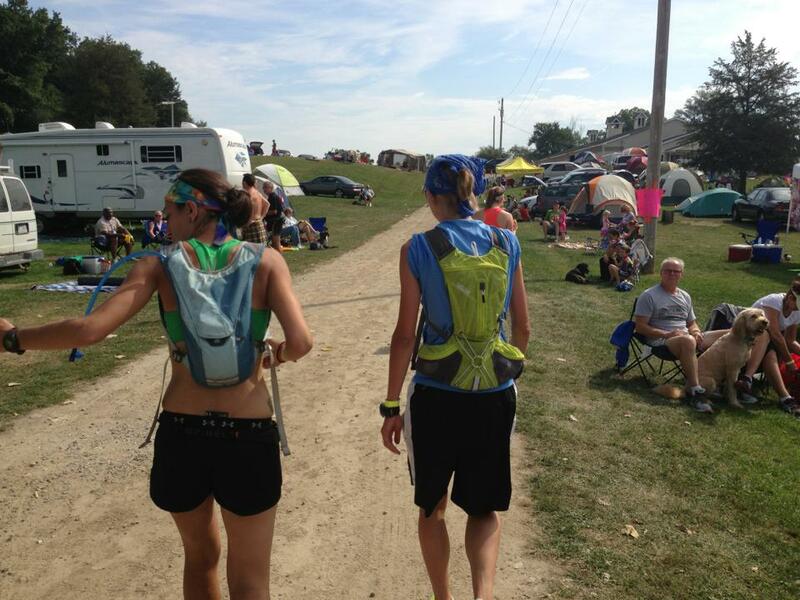 We ran a lap around the campground and up a slight hill and we were already onto the trails. I told myself over and over again to take it easy but it was hard. I hadn’t run a decent distance inover a week! I was more than ready to get the miles in. Within the first half mile I realized there was a lot of sand on the trail which kicked up a lot of dust. It almost seemed like dust was collecting on my eyelashes and in my throat. It wasn’t great, but it also wasn’t terrible. I tried my best to hold back my pace, it was hard. I was having a great time and probably running a little harder than I should have. By mile 10, something didn’t feel right. My digestive system wasn’t happy. I wasn’t nauseous but I had to poop. Yes POOP!! 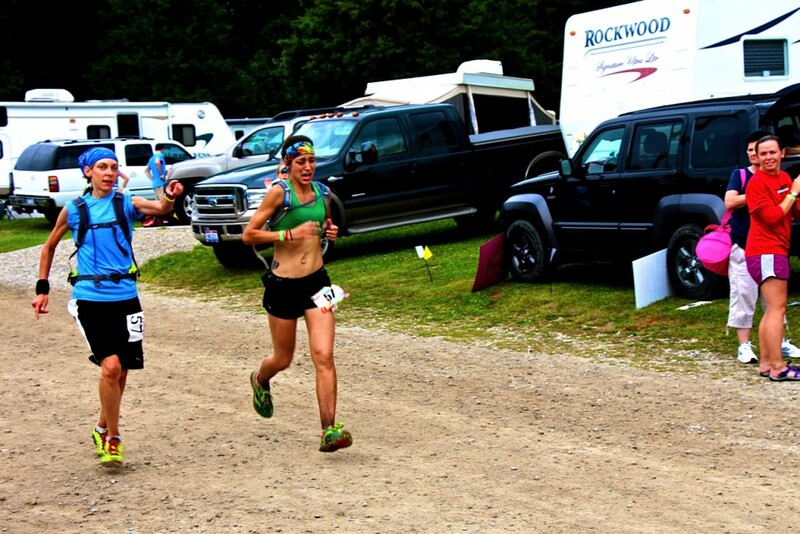 You are getting the good, bad and the ugly with this race report. Luckily at the mile 4/12 aid station (every loop) there were two porta potties. I ended up stopping multiple times on the first loop to settle things down. Somehow I still ran that first loop in just over 3 hours. Way too fast! At the start finish I told my pacers how things were going. I wasfrustrated, but knew I could turn things around. I stopped to eat, change, go to the bathroom, and pick up a headlamp and some warmer clothes and again I was off. I tried to keep the same paceonly to upset the digestive system. I’d have to slow down, walk or even stop completely to settle things. I ended up stopping at the porta potty at mile 4 (20) and 12 (28) of this loop along with a random stop in the woods. It was pretty ridiculous. I ended up running with a man named Nathan. I was so glad to be able to run with him. 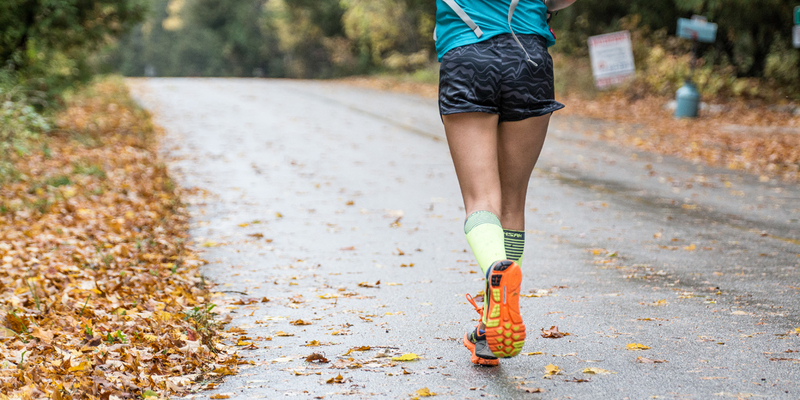 I needed someone to pace me better and help the miles go by faster. We chatted in the dark and had a lot to talk about. 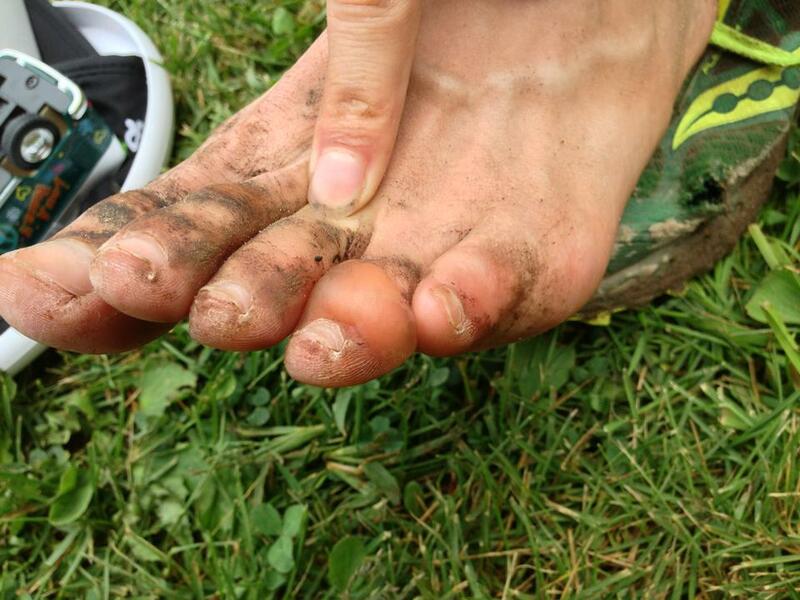 He was also running his first 100 and ran two 50 milers earlier this year and he was also vegetarian! 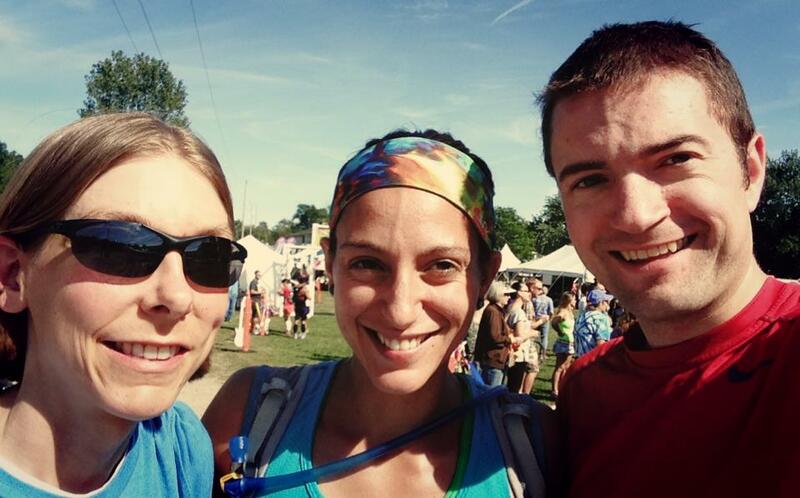 We talked about work, family, running, Scott Jurek, unbreakable, and the conversations went on and on! It was really great. We finally made it back! 33.2 miles down and it was time to pick up a pacer! Steve was going to join me for the first lap around! I was SOOO excited to share the course with Steve and Jen! I wanted to share my excitement with them the whole time! I just knew they were going to love it! I told them that the course was pitch dark under a moonless sky. The trails were tricky and it was hard to maneuver sometimes. The night running was my favorite part. Things were starting to feel better on this lap but I still visited the porta potty again at mile 37.4 and I think again at 45.2 just to be safe. I only had to slow to a walk a couple times on this lap. I’m sure Jen and Steve were worried about me finishing after such a rough start, but I was determined to make things work. Steve and I had a good time out on the trails, he sang disney songs to me and we both looked at the stars and yelled “MARTTTTY” to send positive energy to our good friend Marty who was also going for his first 100 in Minnesota! 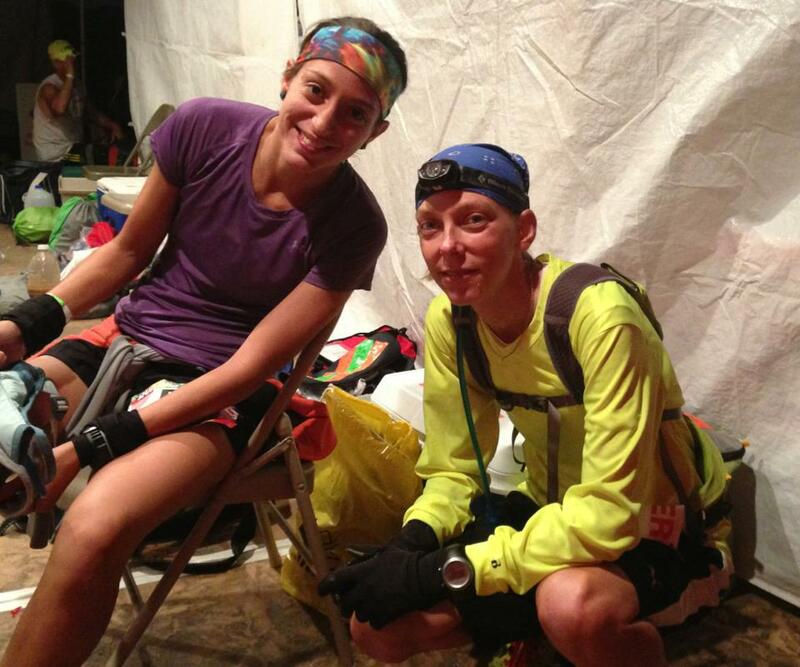 When we got back to the start/finish we stopped at the tent and Jen had made me some pasta to eat. I sat with a blanket to keep warm and ate some food. When it was Jen’s turn to paceshe told me she wasn’t sure what to do. 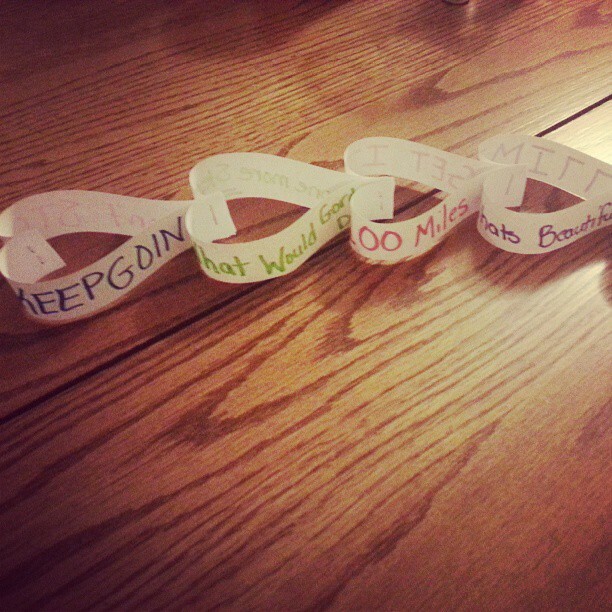 I explained that Steve and I usuallyhave me lead, It seems like I run stronger when I’m in front. On the single tracks Jen stayed back and on the wider trails she was right next to me or just a bit in front and to the side pulling me along. I liked the way that worked… it challenged me, it pushed me! We chatted along and enjoyed the trail. I pointed out a few spots that I knew Jen would love once she got to see the course in the light.. Finally we made it back to the start/finish area 66.4 miles done! The sky had began to lighten a bit when I came in with Jen. Steve was there with pasta. I ate what I could and we were off again before I knew it. The sky was getting lighter and lighter and it was already starting to warm up. I didn’t need my light anymore and shortly after we took off for this loop I took off my tshirt. I knew the heat was going to sneak up on me so I lost the layer before I got too hot. Heat has always made me struggle on runs. This loop with Steve was hard. We were talking about Hailey and family. At that point there was nothing in the world that I wanted more than to lay around and cuddle with her. I began to cry, but I couldn’t make tears. I’m sure other runners thought I was crazy. I was emotional, I missed hailey and I wanted my bed! Even though this would be considered a low point for me, I never ONCE thought about not finishing. I made up my mind about finishing this race long before it started. DNF-ing was not an option at all. I think I cried out of frustration. I still had a long way to go! I wanted some comfort and some rest, but it wasn’t that time. 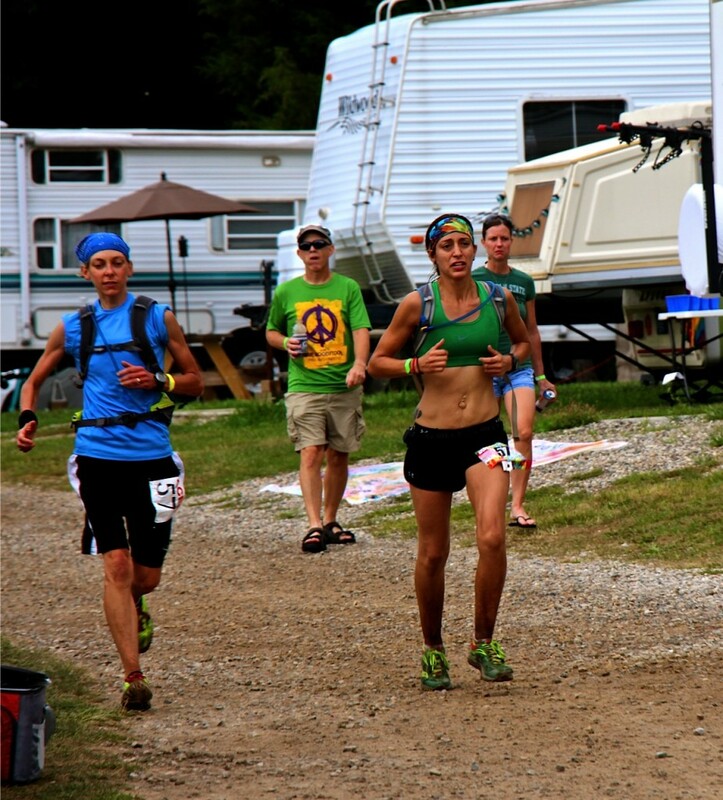 Running 100 miles is kind of like being uncomfortable…. for a very long time, and there’s NO way to get comfortable. You just gotta put up with it and get through it. So there I was on the trails, whining, while Steve tried to cheer me up. As we hiked up a hill I passed a runner and apologized. “I’m sorry you had to hear all that…” He stopped walking to let me pass and said “You are in better shape than me at this point…” I’m sure he could relate to how I had been feeling. Steve did his best to keep my spirits high, including snapping some pics along the trail. “Alright, Jess, cry, get it all out…” He said to me. “Yea, I gotta get all this out before I run with Jen, there will be no crying to Jen!” I responded. I didn’t want to put Jen through any whiney tears of mine. 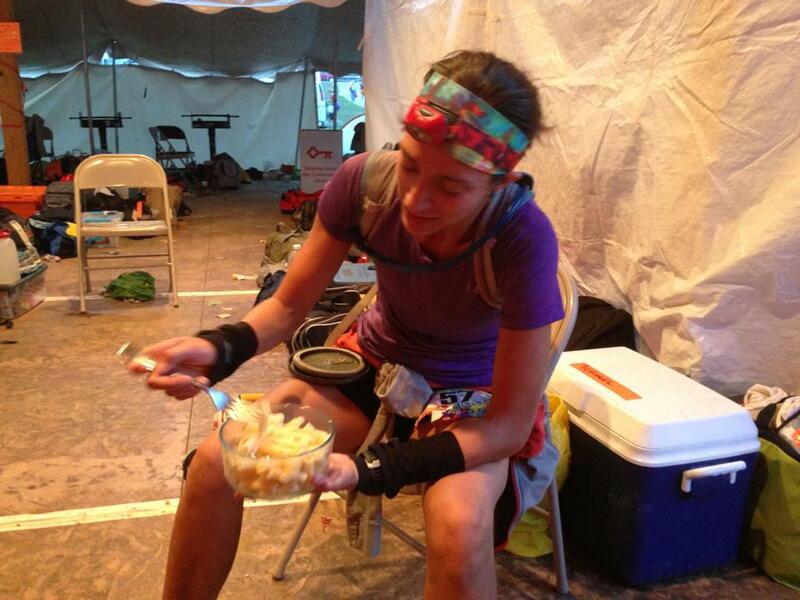 When we got back to the start/finish Jen had brought some potatoes and pasta for me to eat. 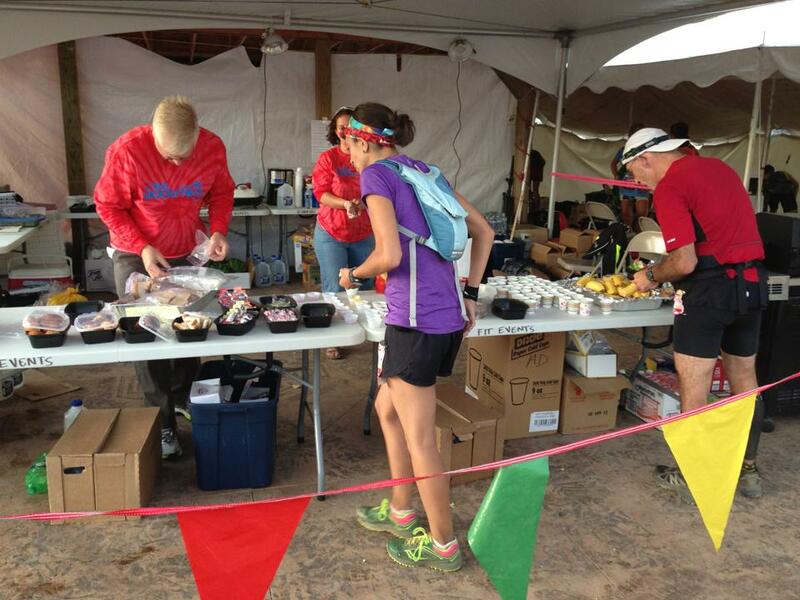 The other aid stations were running out of food. One aid station ran out of potatoes after my 1st lap. Later I found out they were saving them for the last lap for the 100 milers. I’m honestly surprised at how little I ate during this race but I’ll go into that later. I snacked on some olives and took in another salt. I saw Jen peak around the corner at the board a couple times. She whispered to me, “Your second right now, third lady just came in. We gotta go.” For most of this race we had a hard time figuring out who was leading because everyone was so mixed up. Jen and Steve had been watching and keeping track of which females came in when as best as they could. I’m thankful for that because I would have never known. “Third came in and didn’t even stop, which could be bad for her…” Jen said. It was at that point in the race where I made up my mind, I’m keepin’ second. “Alright” I said, “Let’s do this.” I was ready to run as much as I could, and walk when I needed. For the last lap, I ran harder than I’d ever run before. Granted it was more of a shuffle at that point but it felt hard! 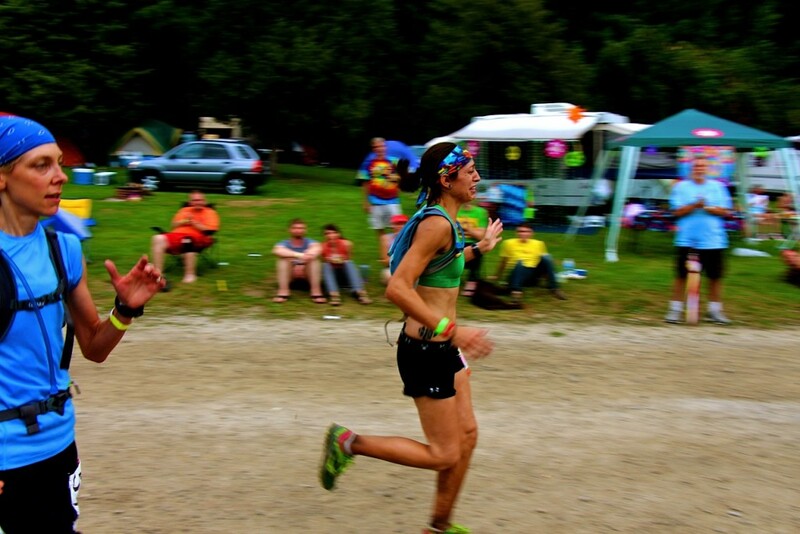 With just over 80 miles on my legs I felt like I was running in slow motion. Jen told me it wasn’t. There were times I hit just over 10 minute miles, now I know that doesn’t sound like much but for those legs and those trails, that was great! 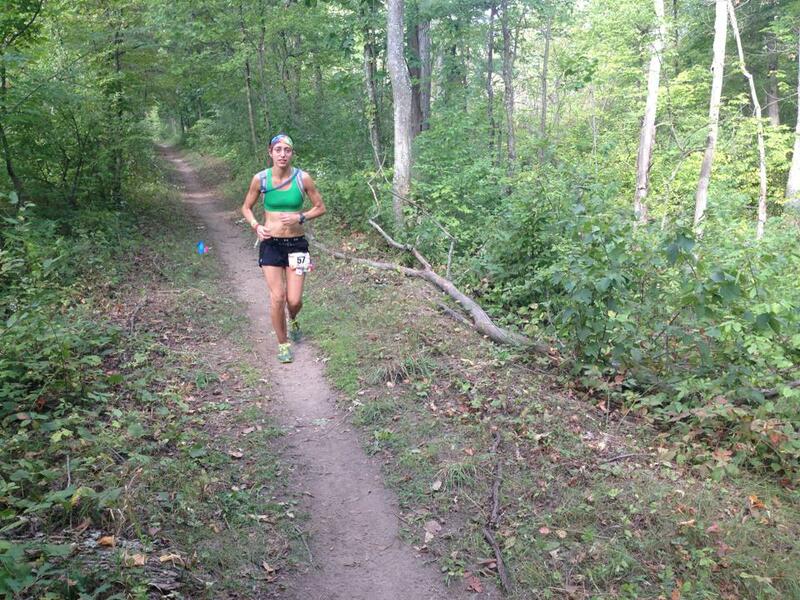 I ran as many of the flats that I could, hiked the bigger hills, and even ran some of the small rollers. Stopping and starting hurt; heck even slowing down to a walk and then trying to run again hurt. I figured at that point, I might as well keep running because it hurt less! We got through the aid stations pretty quick. Jen would ask what I needed and wanted and would help me get to it quick. The camaraderie between runners at this point in the race was insane! I loved it. Even people racing other distances were saying “Nice job!” in passing! 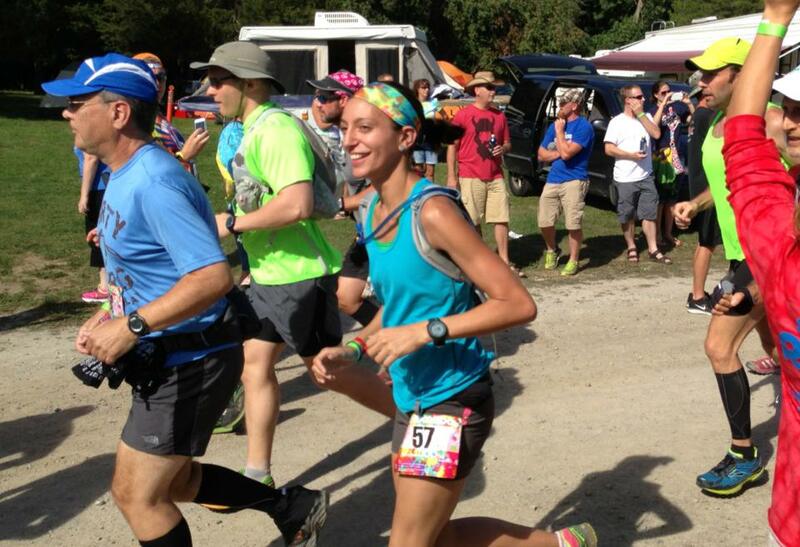 I had other runners clap for me as I passed a few times and other ultra runners were very encouraging! Everyone on the course at that point was digging deep! I think everyone needed it! I tried my best to do the same but I think my encouragement only came out as whispers sometimes. As we got closer, Jen asked how I felt about 10ks? then 5ks? Then she told me “99 miles!” To be honest the last 3 miles always seemed to take the longest for the other loops but they seemed to sneak up on me for the last. Finally we made it to the last right. 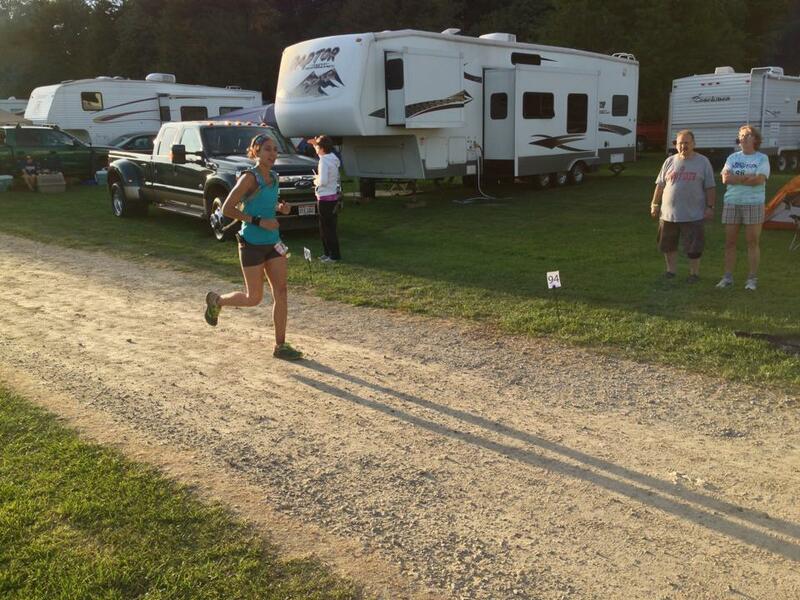 We had to go up the last hill into the campground… We ran it. There were people cheering at the top of the hill and Jen helped to rally the crowd by yelling “100 mile finisher coming through” and “Cheer louder, 100 miler coming through”. It was so great! Once we got up the hill and hit the gravel road we rounded the corner and the energy was just amazing. People were standing and cheering. It was truly electrifying and unlike any other race finish I’d ever had. I still couldn’t make tears but my face sure showed the emotions I was feeling. Months and months of training, long runs, little sleep for all of this, for this moment! It was here! I ran in as hard as I could and it felt amazing!!! Jen had parted off as I crossed the finish line. A medal was placed around my neck and I was given my buckle. 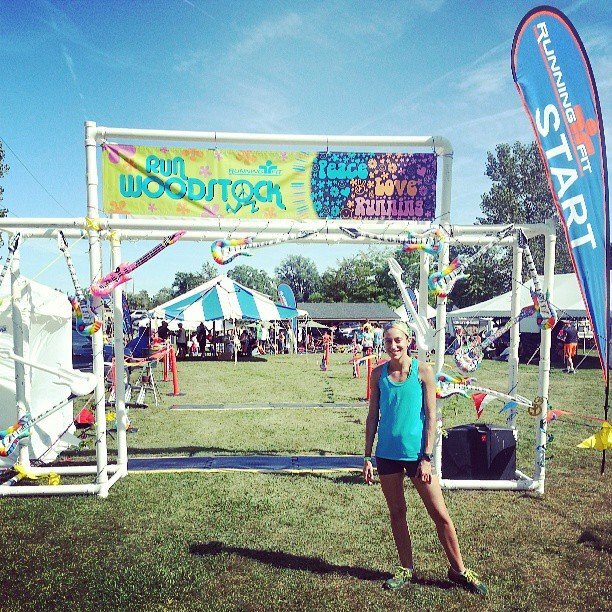 A lady had asked how old I was and informed me that I was the second female finisher and that I had won 1st in my age! I told Jen right away, even though we both already knew! It felt good to hear it officially. I was also given a cute little Run Woodstock Bus as an Age Gender award along with a hat. I walked out of the finishing shoot and met with Jen and shortly after that Steve had found us. The finish line was probably my favorite part! So overall the course isn’t bad, but it wasn’t my favorite. There were a couple long gravel road sections that seemed to never end. I also didn’t expect the amount of sand that was out there. The actual trail sections were great though. I didn’t like the fact that we had to share the course with bikers, most of which weren’t very nice about sharing the trails. It could have been dangerous for both runners and bikers. Especially the way the bikers were flying down the hills. 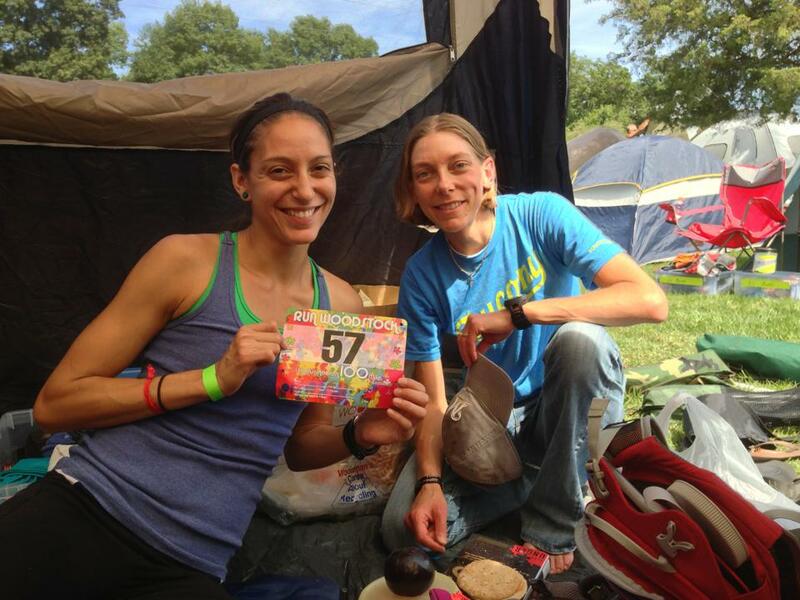 The aid stations and volunteers were great! I would have liked more potatoes since they ran out at a couple places. They were mostly well stocked though. Getting our camping area was a little confusing but not too bad once we talked to the right people. Overall it was a great race experience. I would probably do it again one day! So I fueled this race a little differently. Instead of primarily using GU as energy, I tried to take in solid foods! Thanks to Jen of course. When I was having digestive issues, she suggested that I just try bananas, potatoes, fruits, and just solids to keep my tummy happy. So I did. I supplemented a little bit with GU to get some caffeine but that was it. At one point, the GU gave me a bit of a gag reflex. I ate potatoes, pasta, olives, crackers, chips, pretzels, vegetable broth, and bananas. Honestly, I didn’t feel like I was eating enough but I never felt drained of energy. I stayed away from sugar as much as possible and my stomach felt great. I had ZERO nausea throughout this run, which is huge! One thing is certain, I had the best crew and pacers in the world! I know I couldn’t have done it without them! Not only did they both give up time, energy, sleep and comfort but they spent the entire 23 hours and 15 minutes focused on my race and how I was doing! They were completely selfless! I couldn’t have asked for anything more! THEY WERE AMAZING! HECK THEY ARE AMAZING! 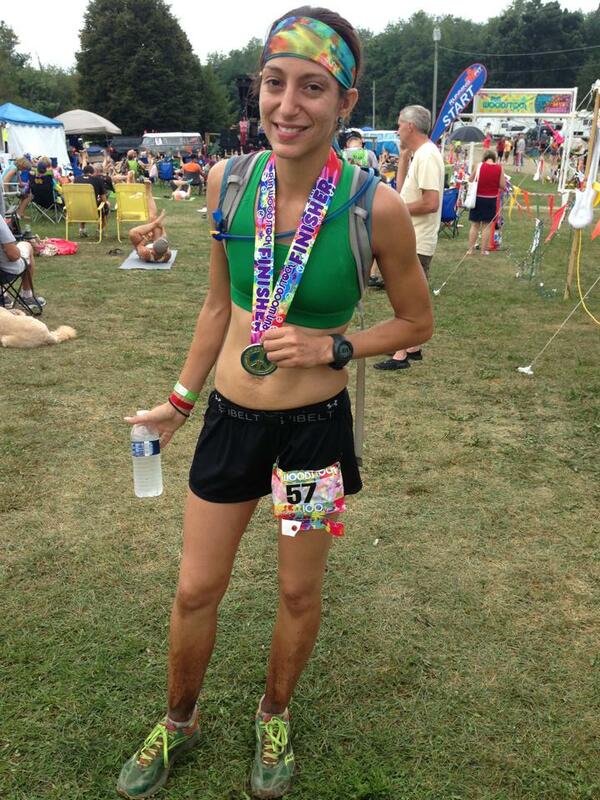 I still can’t believe I ran 100 miles. The whole experience was better than I ever imagined it would have been and I’d do it all over again in a heartbeat!